Find artworks, auction results, sale prices and pictures of William Roxby Beverly at auctions worldwide. William Roxby Beverly - a cornfield with a view towards a distant church, signed with initials, watercolour, 22.5 x 29cms; 8 3/4 x 11 1/2in. 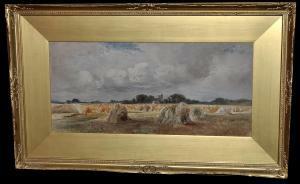 William Roxby Beverly (1810-1889) A cornfield with a view towards a distant church, signed with initials, watercolour, 22.5 x 29cms; 8 3/4 x 11 1/2in.